Something wicked this way comes to Ampersand Inventions this Halloween. Located in the heart of Newcastle city centre, an amalgamation of eclectic minds at Commercial Union House have joined forces to bring you a one night only exciting extravaganza on Saturday 31st October. Phantasmagoria promises to brutally awaken all of your senses and titillate and excite even the most miserable of you earthly souls. For those who’ve not ventured up to the fourth floor of Commercial Union House, the floor is occupied by artist studios, lecture rooms and a quirky little space called Praxis Gallery. It may be small but Praxis has been host to many successful exhibitions within this past year. This Halloween, artists have chosen to invite the public to workshops and open studios, and to fit in with the All Hallows Eve tradition each have based their work around their favourite horror film; Praxis Gallery will be transformed into the infamous waiting room for the dead from Beetlejuice, and the girls from The Candy Vortex are also working on a psychedelic theme of the classic 80’s horror, expect the unexpected! Sherene Scott from Moth Studios will be calling on Hitchcock to inspire her taxidermy demonstrations. Emma Hedley invites you to create your own gruesome jewellery to take home with her The Ring themed workshop and if that is not enough, we dare you visit OptiGo with their Shutter-inspired photo-booth. For the ravenous amongst you, Bake & Butler will be supplying a delicious array of deadly culinary delights, which can be washed down by one or two of the creepy cocktails which will be available on the night (try not to get too mortal). And before the witching hour creeps in the Salivas Next Top Horror catwalk competition will commence at 9.30 and will be open to all who dare enter. Don’t trick yourself into thinking Phantasmagoria isn’t the place to be this Halloween, because you’re going to be in for a treat. 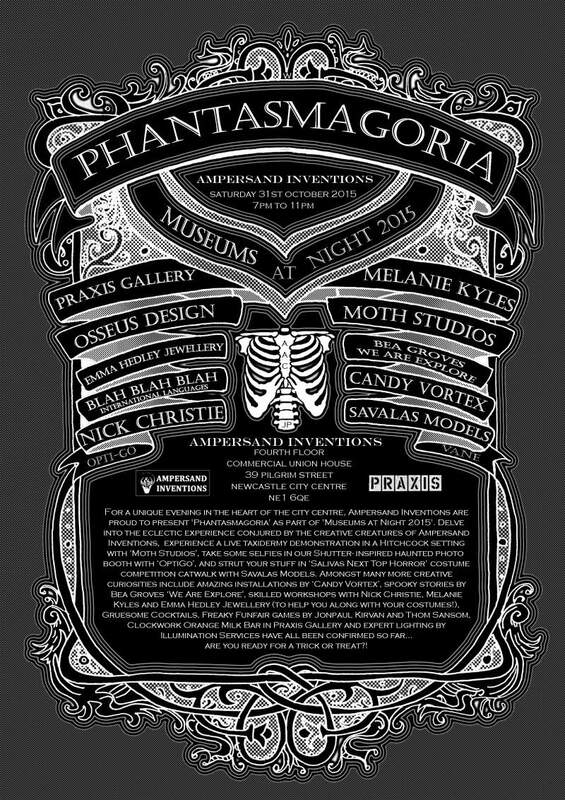 Phantasmagoria takes place at Ampersand Inventions, Commercial Union House, Newcastle on Saturday 31st October.